iOS is an operating system that can be useful in everyday life, even if Internet connection is unavailable at that moment. Here is a list of the best offline apps for iPhone and iPad. These days, it seems almost inevitable that an application requires Internet connectivity to be of much use to you. However, there are still some apps out there that can be used offline – believe it or not – for those who find it difficult to establish internet connection. Fortunately, there are plenty of applications that are designed for these difficult moments of life, and even some of your favorite online applications often have offline characteristics that could come to your rescue. Do not get caught when you are out of internet connectivity, and check out our list of the best iPhone applications offline. Best offline games for iPhone. Essential iPhone apps that does not require Internet connection. Evernote is one of the best offline applications. If you are a person who loves to note tasks, ideas or anything else, Evernote is designed for you. You can create to-do lists, add audio recordings and download Web pages for viewing offline. No need to have an Internet connection (except you want to sync all your notes with compatible devices). Best productivity apps for iPhone and iPad. The popular map application from Nokia. HERE makes it easy to download maps to your device, so you can use it offline. The application helps you find restaurants and shops nearby, and now it also includes indoor maps for the thousands of airports and shopping centers worldwide. If you are in a foreign city, then you will particularly appreciate the public transport information in more than 900 cities, which will help you find your way around without the help of Internet. TripAdvisor is the rightful king of travel applications. With the support of a thriving community, it provides commentary, photos and reviews of fellow travelers and then classifies attractions and activities based on what people say. Trip Advisor provides offline maps, reviews, and rankings for some of the largest cities in the world. Best travel apps for iPhone and iPad. It is an application with great success. Pocket lets you save any web page for future reference later without an Internet connection. You can save videos, articles, websites found on the Internet. 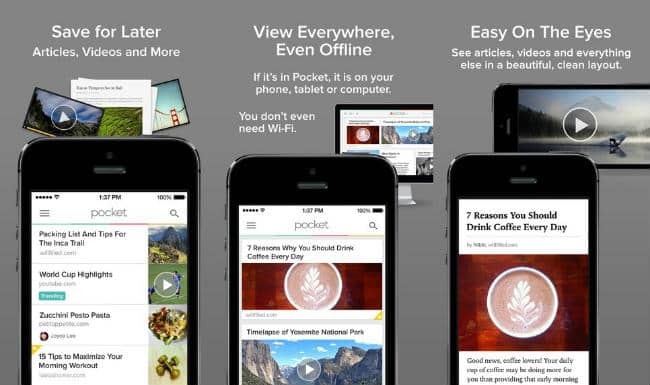 You can access everything you’ve saved on Pocket offline. Instapaper is another major application that allows you to save content to read later. Among its features, you have the ability to create notes in the article, which also can be saved and shared with others. This adds a great value to working with documents. And you, what applications do you use in off-line mode? Please do share your favorite offline apps and your thoughts with us. This will help us to make this article complete. Thank you in advance for your time.